Welcome to Marvel Strike Force Minions page. This is the full description of MSF Ravager Stitcher stats, skills, and abilities. In Marvel Strike Force, Ravager Stitcher is a Ravager minion who provides his allies with healing. Ravagers are an interstellar crime organization made up of pirates, bounty hunters, mercenaries, smugglers, and thieves. There are more than a hundred Ravager Clans all across the Universe with a unique leader in each clan. They all operate under the Ravager code. Most notable are Yondu Ravager Clan, Stakar Ravager Clan, Aleta Ravager Clan, Charlie-27 Ravager Clan, and Krugarr Ravager Clan. Ravager Stitcher costs 15 shards and he is obtainable through raid orbs, violent vigilante orbs, and premium orbs. He is able to heal two most damaged allies for a fair amount of health every second turn (when enhanced). He also has nice speed and chance to apply a bleed to enemies. Ravager Stitcher can be summoned by Yondu. Ravager Stitcher is a spacefaring doctor who prioritizes healing the most severe wounds over those that will merely leave a cool scar. 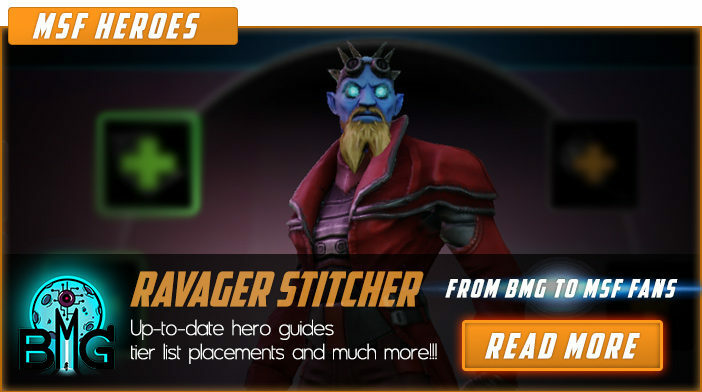 We hope that you enjoyed the description of MSF Minion Ravager Stitcher. For detailed information about other MSF Characters check our MSF Minions page.